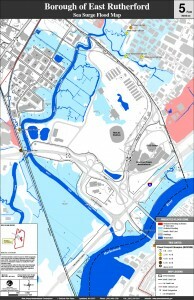 High water levels in the New Jersey Meadowlands are the result of costal surges. During a storm these costal surges can create serious flooding. In order to keep emergency officials informed about rising water levels during a serious storm event a real-time flooding alert system was created. The Meadowlands Environmental Research Institute (MERI) has a network of environmental monitoring stations that continuously report water conditions. This data is transmitted via a 4g wireless network to a cloud distributed data processing application. 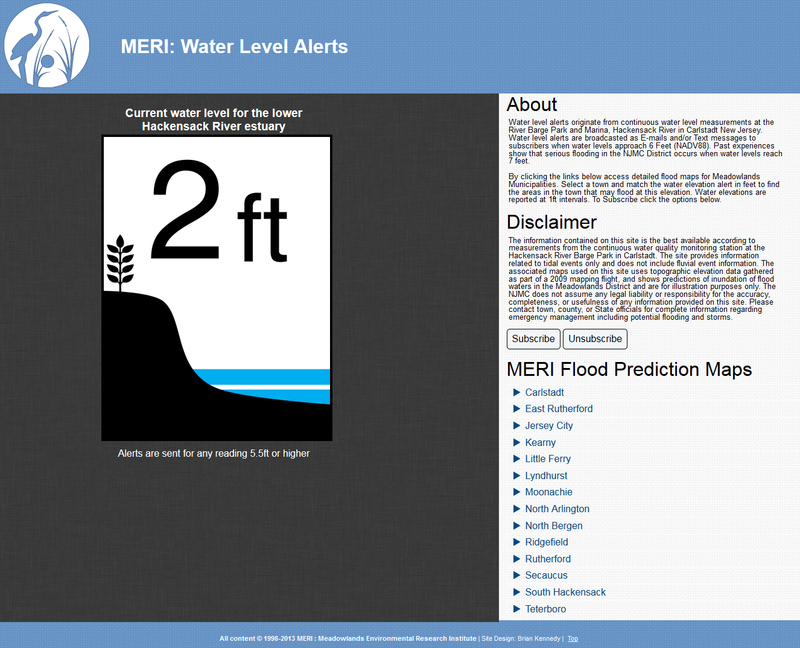 The processing application then analyzes the data and reports the current water level on MERI’s flooding alert website. The flooding alert website serves as a repository for MERI’s flooding prediction maps. These maps were derived from topographic and hydrologic modeling using high-resolution LIDAR (LIght Detection And Ranging) data collected by the New Jersey Meadowlands Commission. Emergency responders can use the current water level indicated on the website and prediction maps to properly assess and mitigate a flooding emergency. When water levels rise beyond a threshold of 5.5 feet sea-level (an elevation determined by MERI to be problematic for flooding) an email and text message alert is sent to all individuals who subscribed to the system. Each alert message contains information about the current water elevation, how to access and download the maps, and a time stamp of when the water level was recorded. This system has proven invaluable for handling a timely response for serious coastal storms, and since Hurricane Sandy subscription rates have increased dramatically. The alert application runs on a cloud distributed hosting to ensure reliability and fast alert distribution. The accuracy of the entire application depends on how quickly the alerts can be distributed. Cloud hosting was also chosen for its reliability. During Hurricane Sandy much of New Jersey lost power, having a system like this running on a nation-wide cloud distributed network avoids potential down-time from localized power failure. Twilio is a web-based SMS provider. Twilio’s API enables the application to quickly send SMS alerts to subscribers with mobile devices. The flooding alerts site was developed with a responsive web design. The site will scale appropriately on all devices and browsers. This allows users to easily access alert information and flood prediction maps on all devices regardless of window size.